10. The song “Sugar, Sugar” by The Archies was number 1 on Billboard’s top 100 hits. Hard to believe that this was a band…in a cartoon! 9. I was born at the beginning of February, and my sign is Aquarius. So it’s appropriate that the top 2 song on Billboard’s chart was “Aquarius/Let the Sunshine In” by The Fifth Dimension. 8. 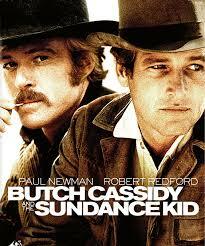 Butch Cassidy and the Sundance Kid starring Paul Newman and Robert Redford was released in theaters. 7. The first automatic teller machine in the United States was installed in Rockville Centre, New York. I use the ATM all the time, and had no idea that ATMs have been around since the year I was born! 6. Some celebrities who are the same age as me are Jason Bateman, Jennifer Aniston, Cate Blanchett, and Christian Slater. 5. On June 22, actress Judy Garland died from a drug overdose at the age of 47. She was only two years older than I am now. 4. After 147 years, the last issue of The Saturday Evening Post was published. Famous for covers by Norman Rockwell and other artists as well as publishing authors such as P.G. Wodehouse, The Post was founded back in the day by Benjamin Franklin. The Saturday Evening Post made a comeback in 1971, and is still published today. 3. From August 15 to August 18, the Woodstock Festival was held in upstate New York, featuring some of the top rock musicians of the era. 2. The Battle of Dong Ap Bia, also known as Hamburger Hill, begins during the Vietnam War. The movie Hamburger Hill is made in the 80’s, and while it is based on this battle, the characters are fictitious. 1. On July 20, when I was 5 months old, my parents watched the lunar module Eagle land on the lunar surface with about 500 million people worldwide. Neil Armstrong took his historic first steps on the Moon at 10:56 pm ET. My mom thought she had the flu; in reality, she was pregnant with my sister. Tuesday Ten is hosted by Lisa from The Golden Spoons and Rabia from The Liebers. I loved the history lesson! Very cool! I love the song Aquarius and not because I am one! Thanks for the trip down memory lane! I graduated H.S. in 1969! That is really something about the automated teller machine. I didn’t even start using one in Illinois until the late 70’s early 80’s. I do remember the other things……..
Gracielle recently posted…Celebrating together: Happy Birthday, A&Z! So cool! I love reading this historic-type stuff. Who knew the first ATM was installed in 1969? I’m a history nerd. I love reading all these post about what happened way back when. 1969 seemed like it was an exciting year. There definitely was a lot happening in 1969! My Granny passed away, we built our first home and celebrated our second anniversary. Your mom had quite a surprise with the flu. Another fun post! Thank you, Janice! Mom sure did have a surprise. My sister was not planned, but it was fun being so close in age. My mom, however, was always exhausted! I can only imagine how exhausted your mom was. Because I had only one child, most of my friends told me I did not know what it was really like to have kids! Ha! I am certain that is true as I watch all the activities with our three grandsons. We were born in the same year! I didn’t realize Jennifer Anniston was our age. Good stuff! Ahh!! The Archies!!!! Love this. You’re a tail ender of the 1960’s – so cool. Michelle was the same year so I had read about the ATM through her too. I’m an 80’s baby but I still feel like we’re all the same age! tamaralikecamera recently posted…I Had No Idea How Much I’d Need Her. Happiest of birthdays! Loved The Archies and Fifth Dimension! What great memories! So glad you are here to celebrate your 45th birthday! Was just at lunch for a dear (younger!) friend’s big 5-0 today! Best wishes for many happy, healthy, sunny, funny returns! Thank you! My husband’s big 5-0 birthday is just around the corner, and we’ll have fun celebrating, I’m sure. Thanks for stopping by! We have the same birth year!! I loved reading Archie comic books – I wanted to be Betty!!! thedoseofreality recently posted…Would You Rather: Be Veronica Mars Or Rory Gilmore? In 1969, I wasn’t born yet, but I still love reading these! Funny how you and Michelle did the same year, but still had very different lists. I love the story of your family watching as Armstrong took the first steps on the moon. I remember very vividly my whole family sitting together and watching when the Challenger exploded. Sad events, but neat memories. Oh, I was in high school when the Challenger exploded, and a teacher must have put a TV in the hallway. I remember watching. It was a very sad day, especially because a teacher, Christa MacAuliffe, was on that flight. Great to read this. I might do a similar list, although probably not for Tuesday 10, since my post is already up and tomorrow’s is made as well. 1969 was a wonderful year. I was 10. I remember that summer day when Neil Armstrong walked on the moon, like it was yesterday. My entire family was glued to the TV. I really don’t remember much else from that year as I was only 10 and was busy playing all the time 🙂 – so I really enjoyed your look back. It filled in the blanks wonderfully! Thank you! I don’t really remember much from the year I was 10, in 1979! I loved playing outside…just like you in 1969! Great list! I remember sitting in front of our TV with my parents watching the moon landing (I was 8 yrs old at the time). Teresa Kander recently posted…The Year I Was Born: What Was Going On? That was a huge event, wasn’t it? I’m sure everyone has some sort of “memory” of Neil Armstrong. I know I’ve seen footage of him landing on the moon quite often! It was fun seeing what you picked since you and I are the same year! We have a couple of the same things, but mostly different picks…there was a lot happening in 1969. Both of the songs you picked are classics in my opinion! I love the song Aquarius! I sing parts of it to my kids in the morning to get them out of bed! It’s from “Hair,” right? Love that too!! Looks like 1969 was a pretty good year! Rabia @TheLiebers recently posted…#TuesdayTen: 1978 Was Really Great!! I think that song is from “Hair,” but I’ve never actually seen it! It’s a fun song!